Recently, Vale has inaugurated its first palm oil plantation in the Amazon-rainforest. 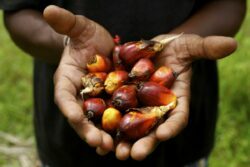 It will occupy an area larger in size than the city of London (175.000 hectares) and the production could reach 600.000 tons palm oil in 2019. The aim of this $ 500 million project is the processing of palm oil into bio-diesel fuel. The produced fuel will run the company´s machinery, ships, trains and trucks and will thus contribute to Vale´s energy independence. Moreover, the company puts forward its intention to contribute to the development of the Parà region, where Vale has acquired the land. The project is expected to create 6.000 jobs and the local farmers are promised to be involved in the production. But above all, this project is in Vale´s financial interests. Vale is a Brazilian multinational, which is the second largest mining company in the world. Mainly operating in South America and Africa, the company is also known for its environmental damages and health hazards. Posted in Harmful Cases. | Tagged Brasilien, Brazil, palm oil, palmöl, Vale.